This post contains affiliate links, which means if you choose to purchase something I will earn a small commission at no additional cost to you. Let’s just start by saying this: I ❤️ MY IMMERSION BLENDER. 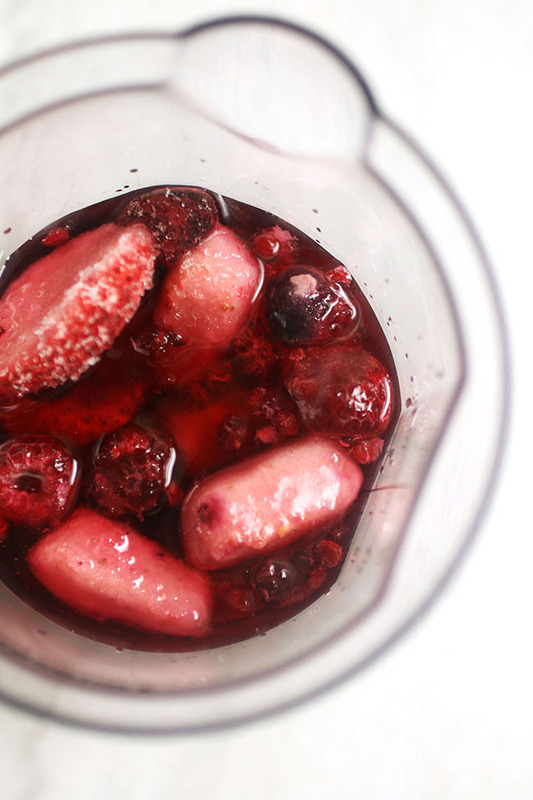 If you’ve followed Life As A Strawberry for awhile, you may have noticed this handy dandy little hand blender pops up in about a zillion recipes. I use it for EVERYTHING. Still, I get asked pretty frequently whether an immersion blender is really worth it. My short answer? YES. A THOUSAND TIMES YES. Immersion blenders are compact. My hand blender takes up almost NO space – it’s small and fits just about anywhere, which makes it PERFECT for my tiny apartment kitchen. They’re relatively cheap. You can get a good immersion blender for under $40 – try finding a high-quality food processor for that price! (Spoiler alert: you can’t). They’re fast. It takes all of 30 seconds to make some of these recipes. SO SPEEDY. I love it. They cut down on cleanup. The greatest thing to me about using an immersion blender instead of a bigger appliance is that I’m left with hardly any cleanup. (Cleaning = the worst). Just clean the blender piece and whatever bowl or pot you blended your creation in, and you’re wham-bam-donezo. Soooo…let’s just jump right into the good stuff, shall we? 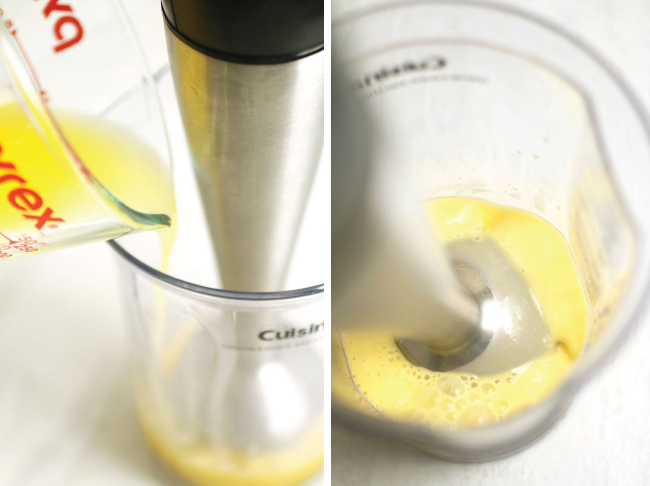 Cusinart Smart Stick 2 Speed Hand Blender // This immersion blender is just plain awesome. It’s cheap, it’s sturdy, and it comes in every color you could think of. It also comes with a handy dandy beaker (that you can use for the recipes below!) and the beaker and blender part are both dishwasher safe (SCORE). It’s small enough that you can hold it with one hand but big enough to tackle large pots of sauce or soup. It DOES have a cord, so keep in mind that you have to have it plugged in to use it. It’s also the #1 selling hand blender on Amazon and has an average 4.6/5 star rating from more than 2,900 reviews! MY CURRENT IMMERSION BLENDER: Cuisinart Smart Stick Cordless Rechargeable Hand Blender // So, I have this issue with coordination. I love the immersion blender above, but I found that the cord would get in the way while I twirled around the kitchen. I kept knocking things over with the cord, and it was driving me CRAZY. So last year, I upgraded to this cordless hand blender – it works just like the immersion blender above, but there’s no cord to get in my way! The blender comes apart into three pieces – I leave the charger piece plugged in all the time and just snap it together when I’m ready to use it! It’s a lot quieter than the immersion blenders I was used to, but it’s just as powerful, and I can use it for quite awhile before I have to recharge. (Context: I shot all 10 recipes for this post on the same day, and I didn’t have to recharge the blender once). This hand blender also comes with a mixing beaker (you’ll see it used in the photos below). The only downside is it’s pretty tall, so it’s a little awkward to hold it with one hand for an extended period of time. But I wouldn’t trade it! Wash it as soon as possible. The blade of the immersion blender has lots of hard-to-reach spots, and if you let it sit for too long it can be hard to clean it completely. As soon as I finish blending something, I run the metal piece of my hand blender under VERY hot water and give it a gentle scrub with a soaped-up sponge. Move it around. 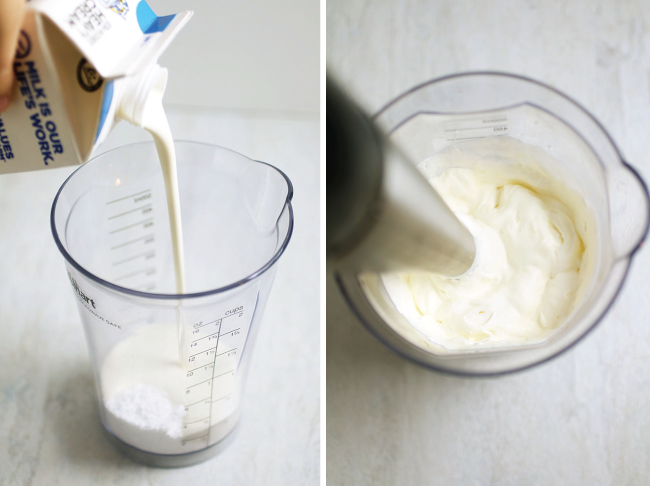 Move the blender around for best results – when I’m using the plastic beaker, I move the blender up and down as it blends so that it picks up everything and blends evenly. If I’m blending a big pot of soup, I move the blender in a slow stirring motion so I don’t miss any big pieces! Let hot dishes cool before blending. When you’re making soups or other hot blended dishes, remove the pot from the heat and let cool for 10-20 minutes before you blend anything. Things can spatter occasionally when using a hand blender, and getting hit with a drop of boiling hot soup is never any fun. 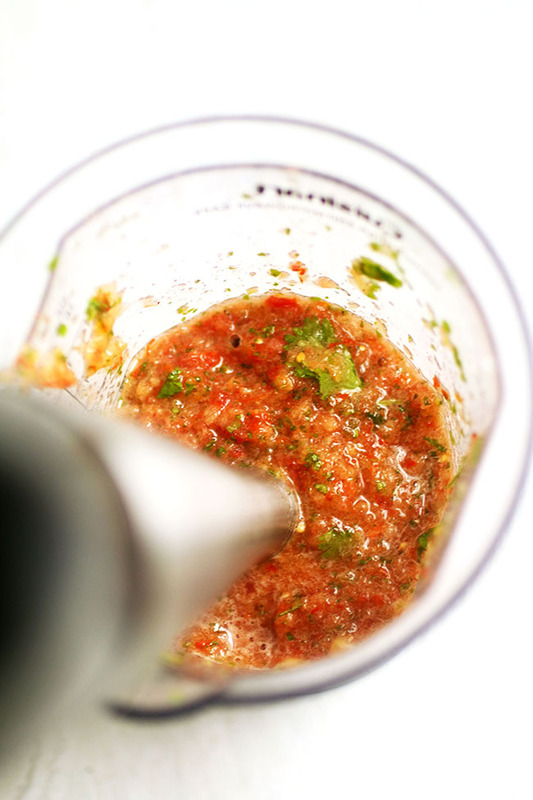 Immersion blender salsa is my new favorite thing. 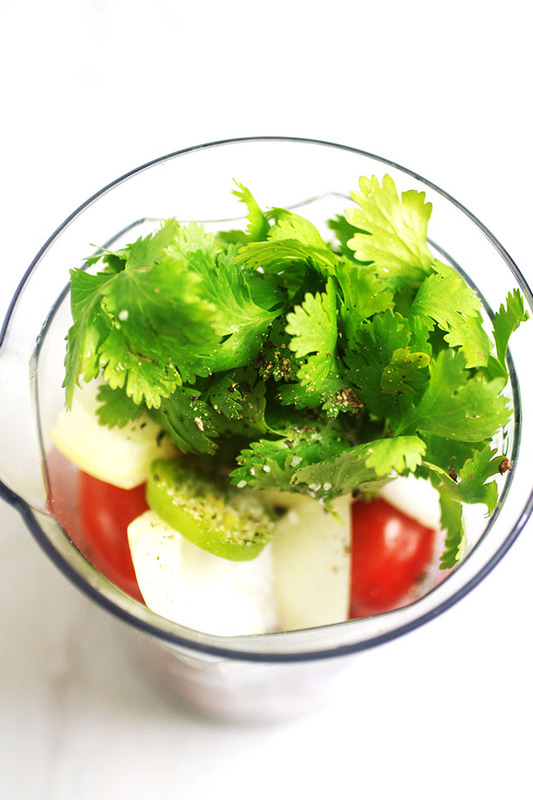 I love salsa, but I’m really not a big chunky food fan, so blending a smooth salsa with a hand blender is the perfect solution for me. Throw some tomatoes, onion, garlic, jalapeño, cilantro, salt and pepper in a tall narrow dish (I used the beaker that came with my hand blender!) 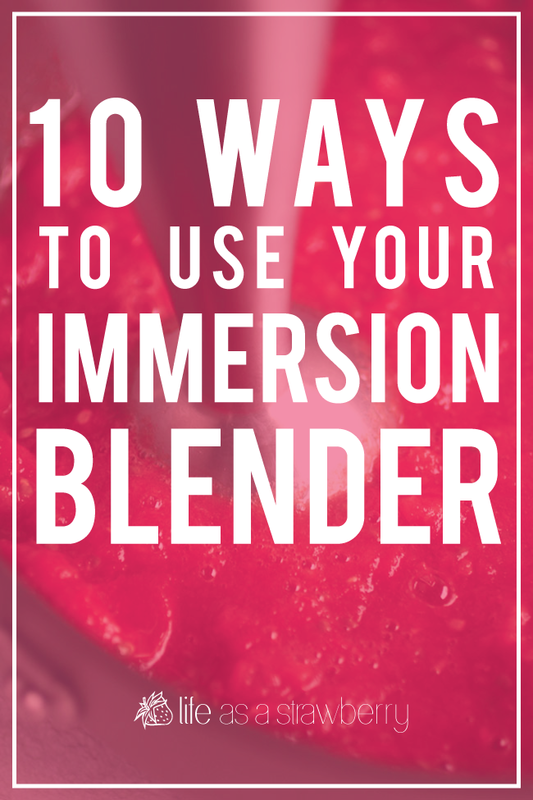 and move the immersion blender up and down while you blend until you have a smooth salsa. 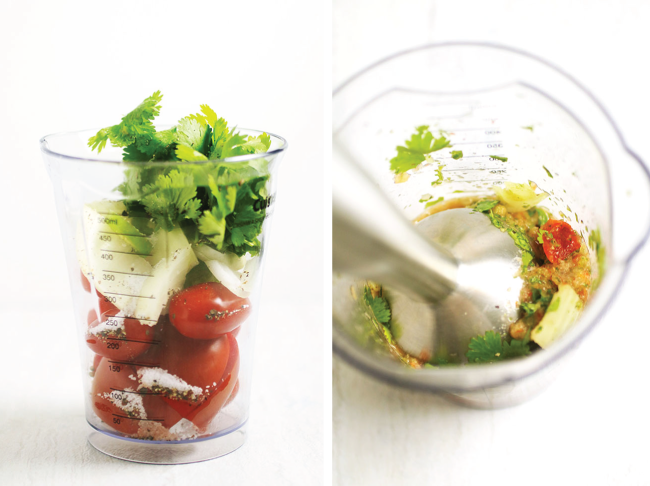 TIP: Put the tomatoes on top in the beaker – they’re easier for the blender to break down and will add some liquid to the salsa so the other ingredients blend more quickly! My immersion blender has me like “PRESTO, PESTO!” (annnd…it’s the best-o? FINE, I’LL STOP). Now, the food processor gets alllll the attention when it comes to pesto-making, but honestly? An immersion blender works just as well for me. Just toss some fresh basil leaves, garlic, salt and pepper into a tall dish (plastic beaker for the win! Also, I just love saying the word “beaker”) and stream in a bit of olive oil. 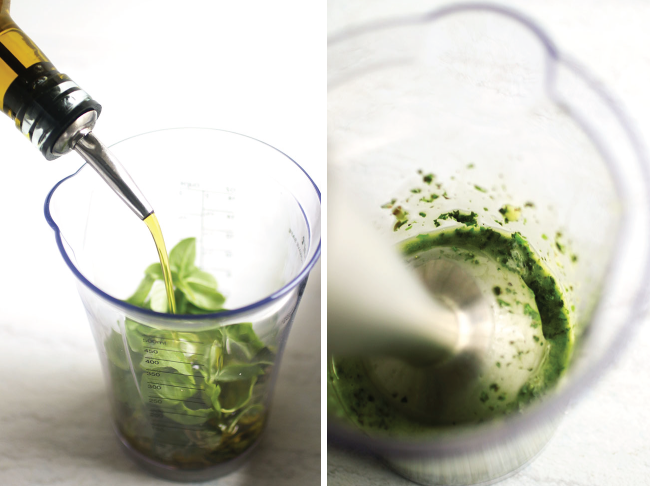 Blend with the immersion blender (use that up-down-up-down motion we talked about) until you have a smooth pesto. 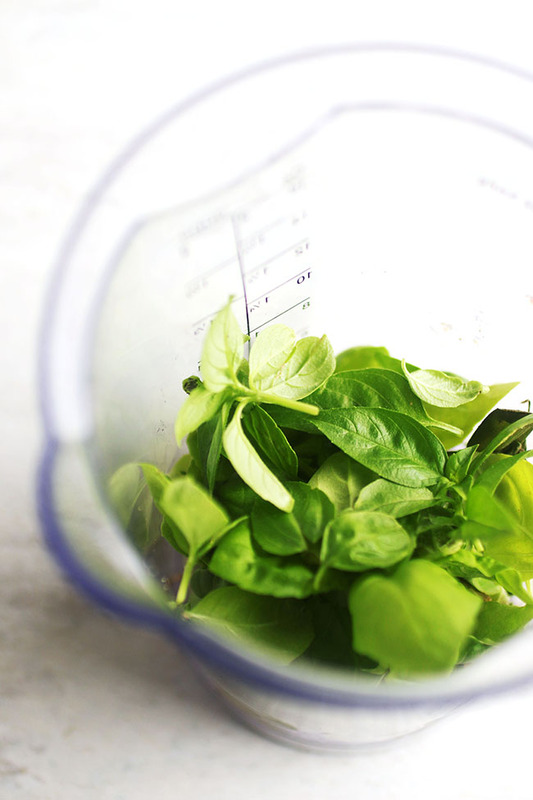 Sub arugula, parsley, cilantro, or even spinach for the basil to give your hand blender pesto a fun twist. WHAT?! AN EASIER WAY TO MAKE WAFFLES?! (Somewhere, Leslie Knope is jumping for joy. She gets it). This was a major “DUH” moment for me and my immersion blender. The plastic beaker has a built-in spout, is the perfect size for a breakfast’s worth of pancake batter, and it takes all of five seconds to mix everything up lump-free. 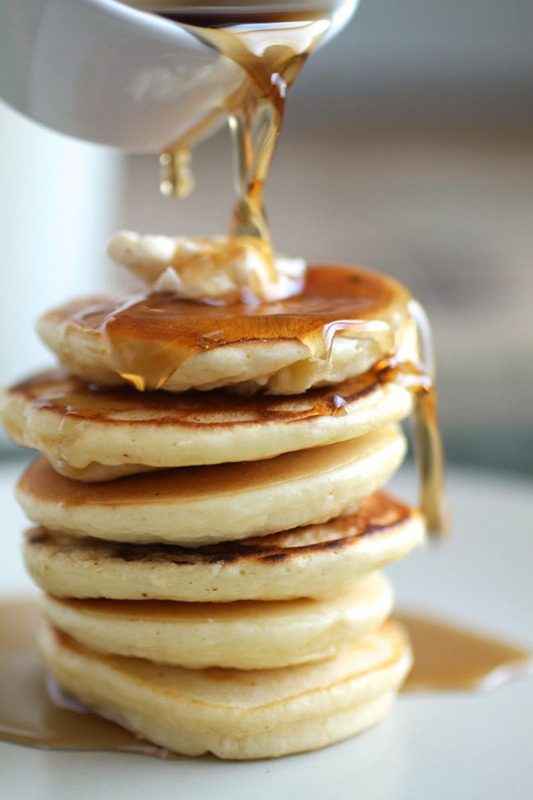 In short, everyone should be making their pancakes and waffles the hand blender way. 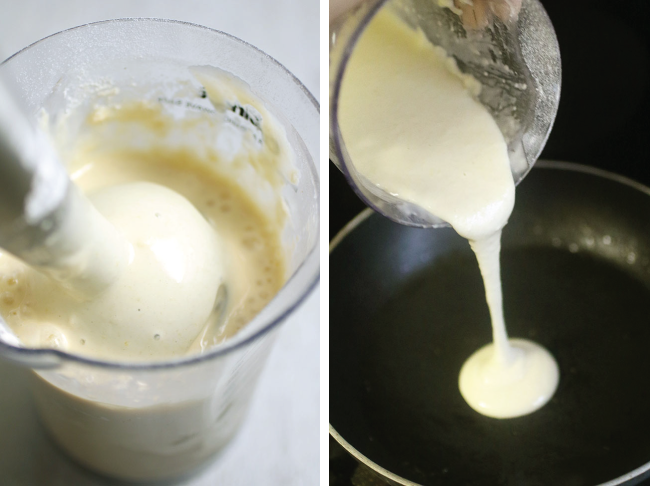 Just toss the ingredients for your favorite pancake batter into the trusty ol’ beaker and up-down-up-down blend away until you have a smooth batter. 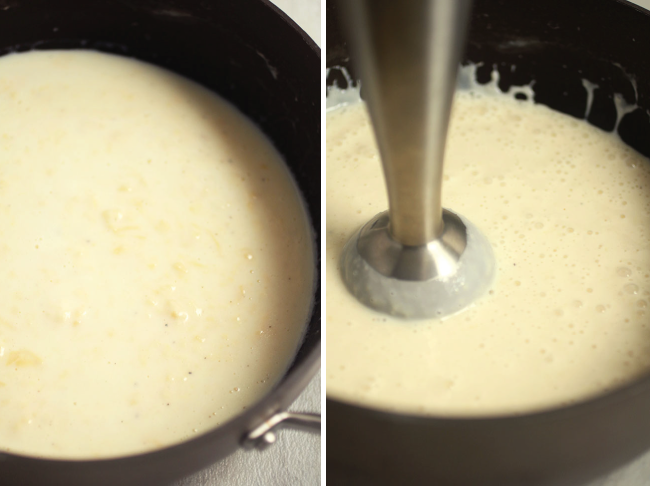 Pour the batter directly from the beaker onto a hot griddle or waffle maker, and voilà! Breakfast time, anytime. Another immersion blender breakfast breakthrough! Using a full-on blender for my one single breakfast smoothie always felt like such a waste to me – it took too many dishes and the cleanup just wasn’t worth it. 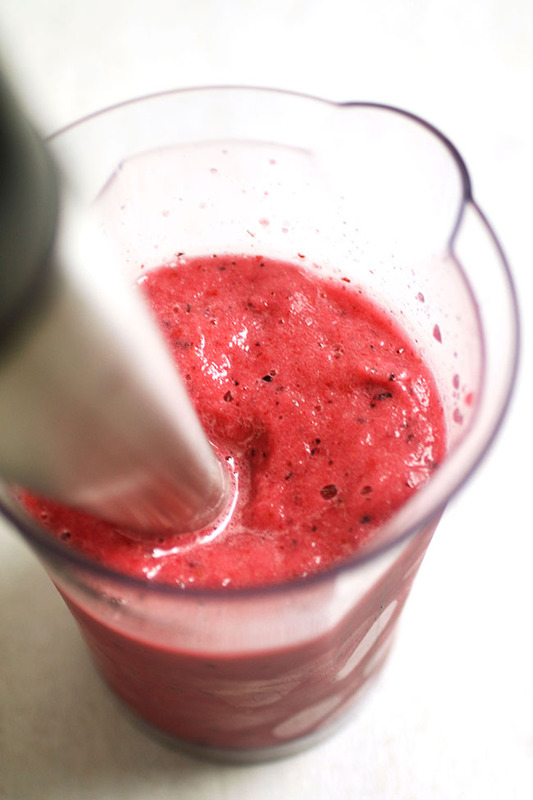 Enter the immersion blender smoothie! 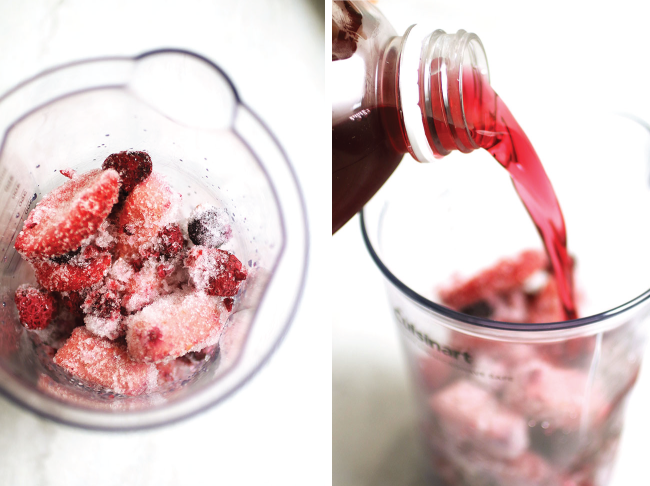 I toss some frozen fruit and yogurt cubes into the beaker (YAY FOR THE BEAKER), add just enough juice to cover all the fruit, and up-down-up-down blend away until I have a smoothie. I wash off the immersion blender, stick a straw right in the beaker, and BOOM! Smoothie heaven with minimal dishes. One of my favorite things about my immersion blender is its ability to save sauces that aren’t looking so hot. 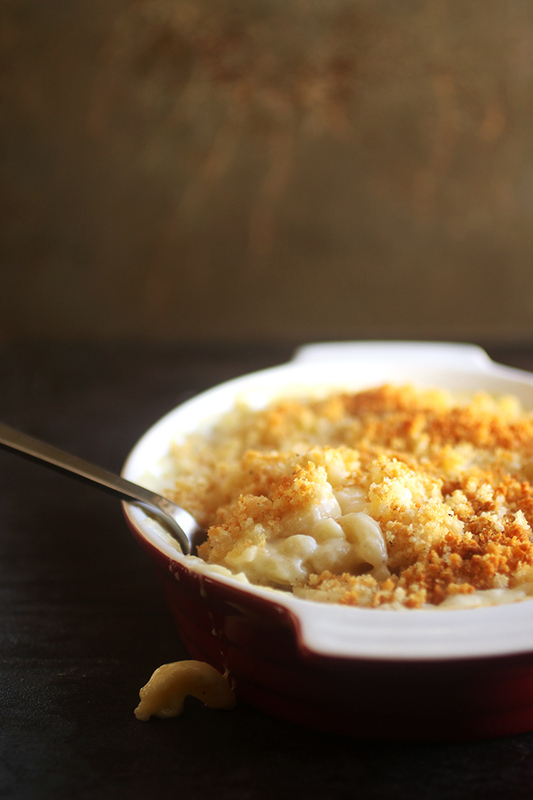 Take mac and cheese sauce, for example: if your cheese doesn’t melt properly, you can end up with a weird, goopy, unappetizing sauce. But hit any lumpy sauce with an immersion blender for just a few seconds and you can bring that sauce back to smooth, cheese-y, delicious life! 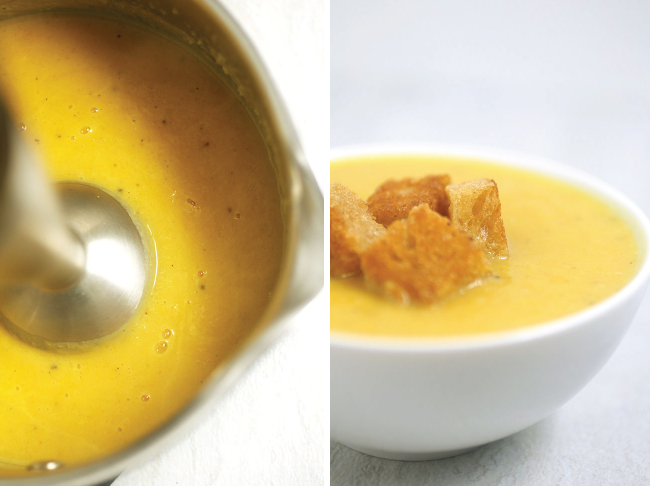 This one might venture a bit into “stating-the-obvious” territory – but even though I use my immersion blender in a ton of different ways, making creamy, delicious soup is by far my hand blender’s most frequent culinary adventure. So we couldn’t just leave it off the list! I much prefer smooth, velvety soups to chunky stews, and when wintertime hits I use my immersion blender a few times a week to whip up quick soups. 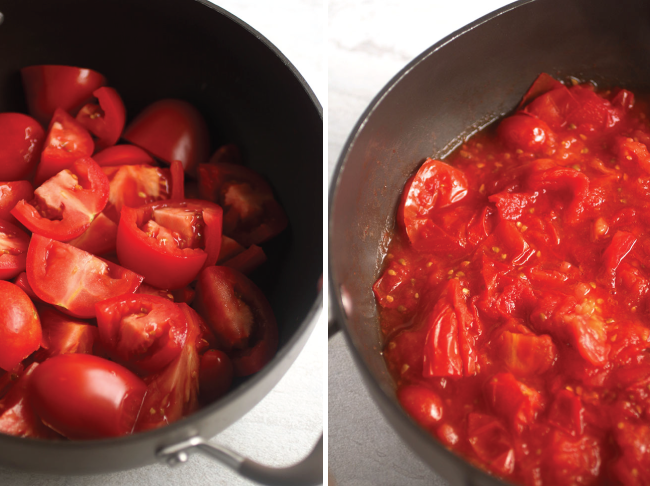 Homemade tomato sauce is SO. EASY. 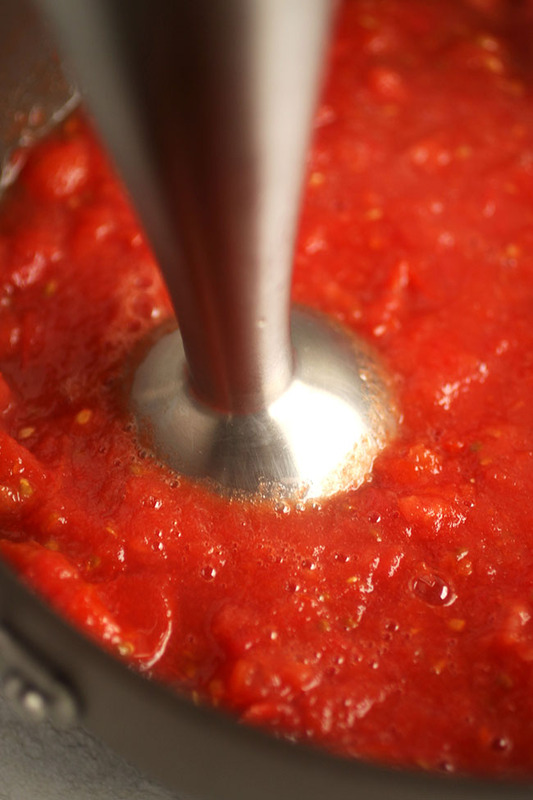 Especially when we’re talking about immersion blender tomato sauce! We pick a TON of tomatoes during the summer, and I like to turn the bulk of them into tasty tomato sauce that we can use all year round. It’s better (and more fun!) than the canned stuff you find at the store. I always hear people talk about how important it is to peeeeeel the tomatoes and then seeeeeed the tomatoes and blah, blah, blah when you’re making tomato sauce. But, umm…I do none of those things. One, because I’m ultra-lazy, and two, because I honestly don’t notice any difference in taste or texture when I take those extra steps. Wash the tomatoes (I like to use Roma tomatoes, but use whatever you’ve got!). Quarter or halve them so they’re all about the same size. Fill a pot with the tomatoes. Put that pot over medium heat and cook for an hour or so until tomatoes have reduced. Remove pot from heat and let cool 10-15 minutes. It’s no secret that I’ve been on a major eggs benedict kick lately, and you may have noticed that each of those recipes has instructions for an immersion blender hollandaise sauce. 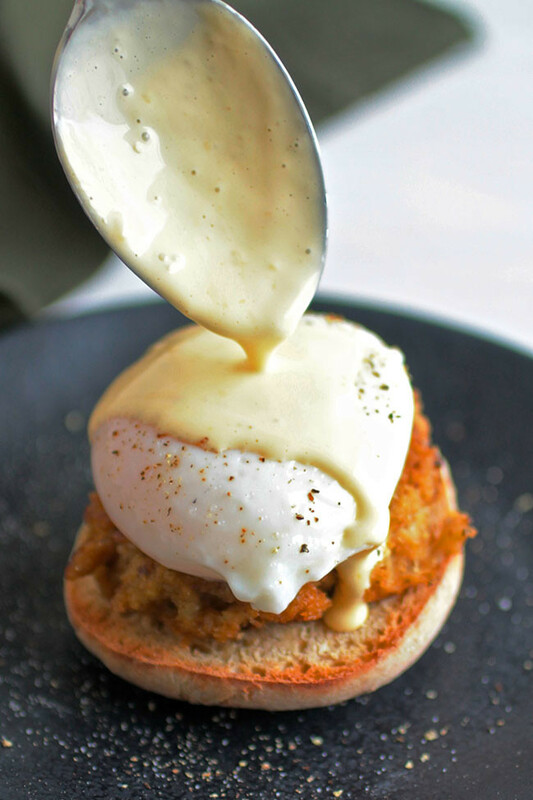 It is SO EASY to make your own hollandaise, and the immersion blender hollandaise method takes a seemingly complicated dish like Eggs Benedict and makes it quick and easy. 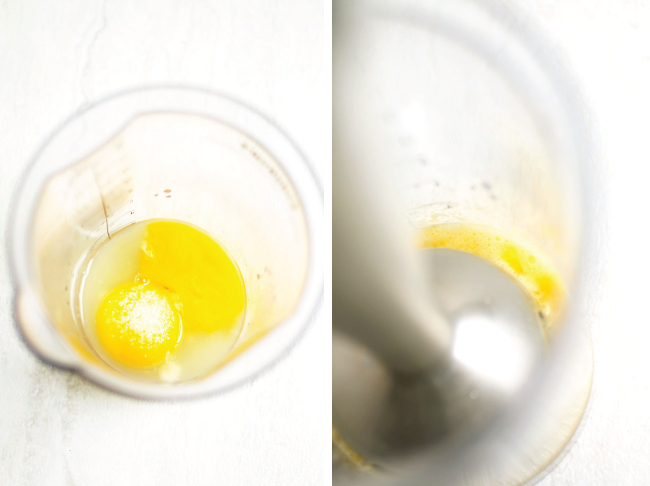 To make your own hand blender hollandaise, add two egg yolks with a splash of lemon juice and a pinch of salt to your beaker (BEAKER!). 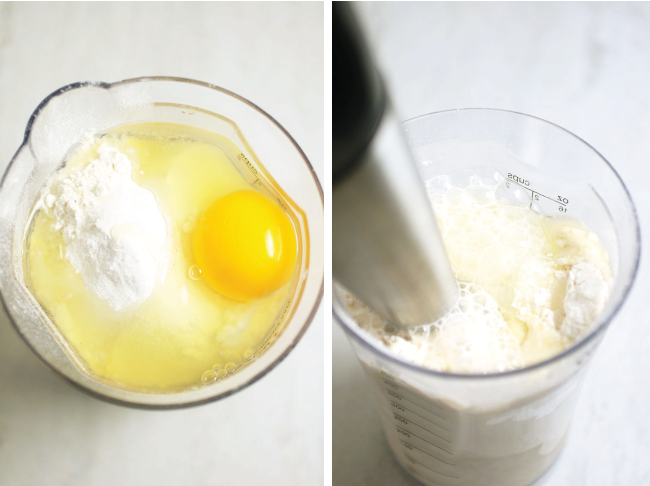 Blend until eggs have lightened in color and thickened slightly, about 10 seconds with our trusty hand blender. Melt 1 stick of butter (it should be quite hot) and stream the butter into the egg yolks while blending until you have a smooth hollandaise sauce. Pour it over a poached egg atop a toasted English muffin, and then do a happy dance because you totally just won at brunch ??. This was another major, MAJOR a-ha! moment for me and my hand blender. Immersion blender whipped cream! Ready in under 30 seconds! Amazing. AMAZING! Add a tablespoon or so of powdered sugar and about 1/2 cup of heavy cream to our trusty beaker. Up-down-up-down immersion blend for 10-15 seconds until cream has stiffened and looks, well, like whipped cream. 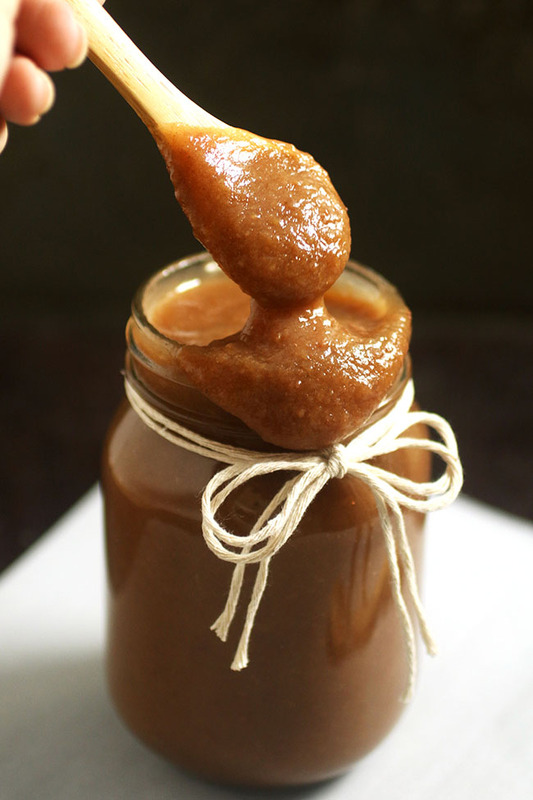 Homemade apple butter is SO. GOOD. And so easy! Toss cored, roughly chopped apples with some cinnamon, cloves, lemon juice, and a splash of maple syrup. Cover and cook on low heat for an hour or two until apples have reduced. 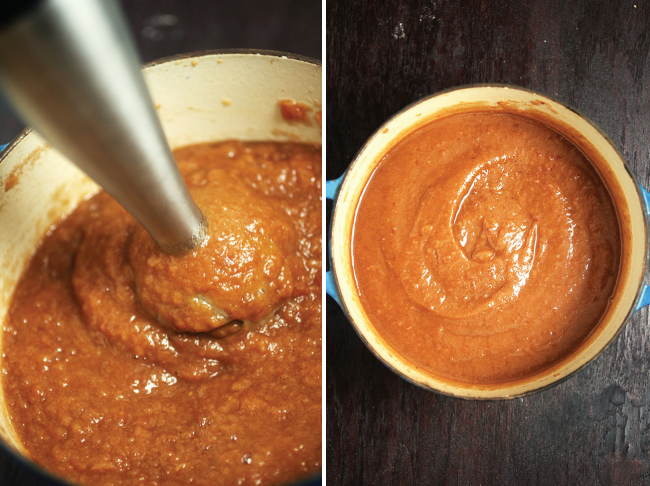 Let it cool for a few minutes, then hit it with an immersion blender to form a smooth apple butter. (Find more detailed directions and my favorite recipe here). 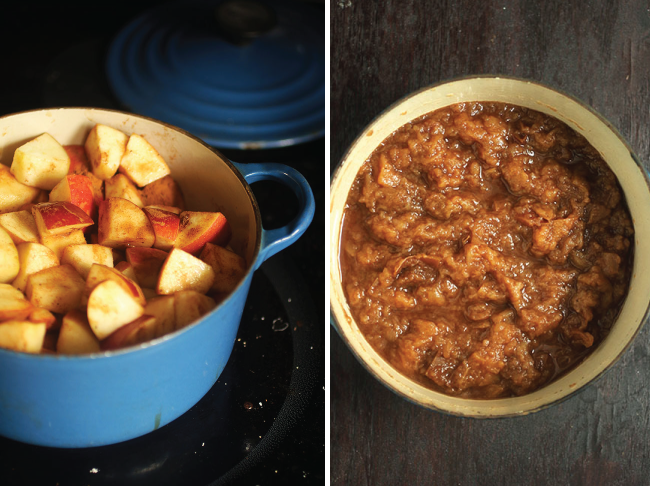 Serve the apple butter warm on buttered toast or pair with some brie and crostini. Eating it with a spoon or faceplanting straight into it are also acceptable. Phew – we made it! If you’re ready to jump headfirst into the amazing world of immersion blender-ing, definitely check out this Cusinart 2 Speed Hand Blender – it’s Amazon’s #1 BEST SELLER in hand blenders and has great reviews (plus, umm, it’s awesome). 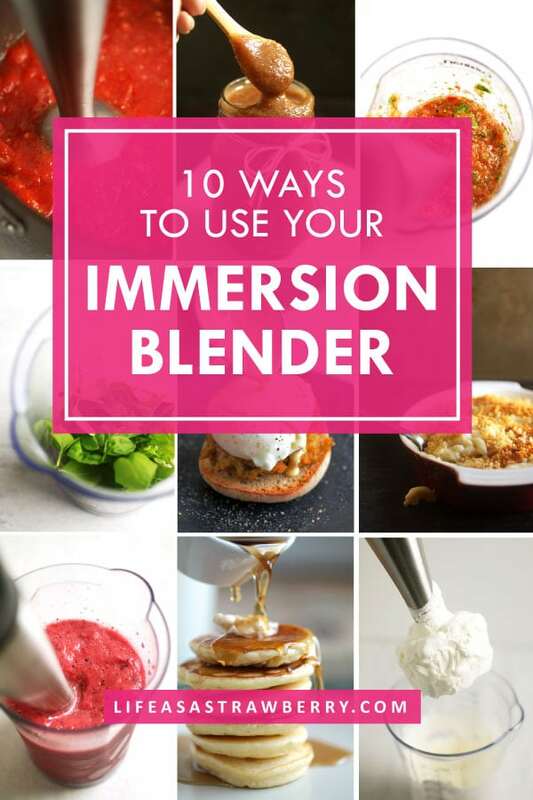 What are some of your favorite immersion blender recipes? I’d love to know – just leave a comment to share! Disclaimer: This post contains affiliate links. As always, all opinions are my own and I only recommend products that I know and love! 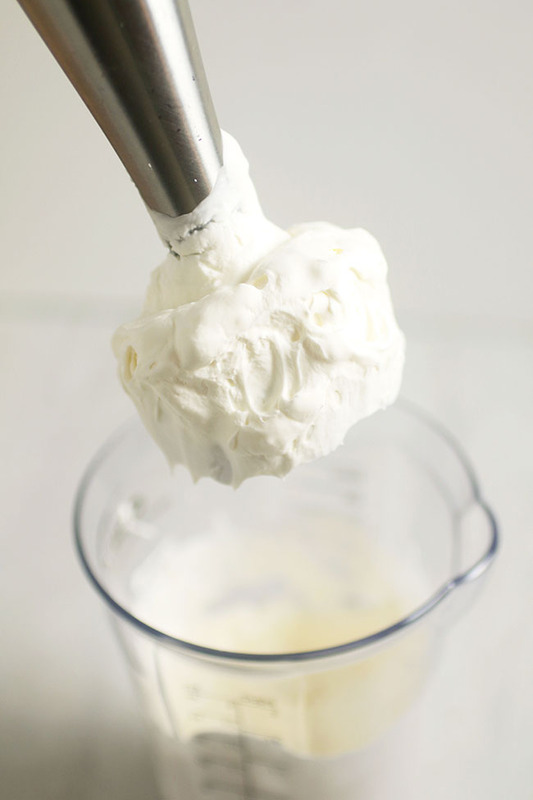 I like to use the whisk attachment when I add food coloring gel to batter or frosting…so much faster than trying to incorporate the color with a spatula or conventional whisk. I have wanted one of these for a long time, but couldn’t justify buying it just for soups. Found one today “on sale” at the grocery store for $8. Coincidentally, I had broccoli cheese soup at home simmering in the slow cooker. So I bought it. Worked great for the soup and now thanks to your blog I have other ideas for using it. Thank you much! Hi Doris, so happy to hear you’ve been inspired! I’ve had my immersion blender for years and I have only used it once (when I first got it) and it did not go well! It’s been sitting in my cabinet since. BUT I just did a search on what to do with it since the holidays are here and I thought I’d see how I could use it…I found you and all of these great ideas! Going to get started today. First thing will be the tomato sauce! Then smoothies of course…😊 Thanks so much for sharing! Hey Stacey, so glad you found us! I was hoping to find a way to continue making Smoothies after my Nutrbullet bit the dust. I also don’t want to buy another one because they take up too much counter space in my tiny RV. 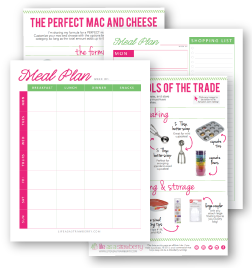 I stumbled upon your site and I can’t wait to try these recipes. I have a Hamilton Beach immersion blender and I think it will work for most if not all of them. Great ideas! Hey Beverly, glad you found us! How did the immersion blender work? Thanks for your tutorial regarding the immersion blender. The recipes were great too!! Hi Colleen, glad you enjoyed it! I’ve been wanting to get a Vitamix since a friend turned me on to his. But I realize it would be a major waste of money for me, since my immersion blender (an old Braun) makes great smoothies right in the beaker! Thanks for reminding me that I’ll be ok NOT spending a fortune on a blender! Hi Robert, you are very welcome! No need to get something new, when the current one works!